What are the Vikings Options With Their Salary Cap Situation? Any Vikings fan is aware of their horrendous salary cap situation. According to Spotrac, the Minnesota Vikings are currently sitting at $6.4 million dollars in cap space, and that does not include Ameer Abdullah just being resigned. It is hard to do anything in free agency with such a low cap space. With the NFL Draft coming up on April 25th, the Vikings will need at least $3 mill in cap space to accommodate their new incoming rookies. On top of that, the second wave of free agency is about to begin and the Vikings won’t be able to do much unless they make some roster moves soon. Last offseason, the Vikings picked up Waynes’ fifth year option keeping him in 2019 for a price tag of $9 million. The Vikings can release him with no penalty, but it would make more sense to trade him and get something back in return. With Waynes being the No. 2 cornerback behind Xavier Rhodes, I am doubtful that the Vikings would just release him, even though they are pretty deep at the cornerback position. Behind Waynes is, Mackensie Alexander, Holton Hill and a promising rookie that tore his ACL, Mike Hughes. If the Vikings can get a good return for Waynes, I wouldn’t be surprised if they traded him. This move might be hard for Vikings fans to swallow, but releasing Rudolph would free up $7.6 million in cap space. Rudolph’s production is not what it used to be, and Spielman might think that he isn’t worth what he’s getting paid. The Vikings could also look into restructuring his contract, but that wouldn’t free up nearly as much as releasing him. This upcoming draft is littered with tight end talent, so it’s very possible that the Vikings could release Rudolph and look to replace him through the draft. If Spielman were to restructure Reiff’s contract, that could free up roughly $5.7 million in cap space. According to PFF, Reiff was the 23rd ranked tackle in the league which is not living up to the contract he was given. Everyone knows that the Vikings need help along the offensive line, freeing up some cap by restructuring Reiff’s contract would give them more room to work. This is probably the least likely out of all these scenarios, but it is still possible. If the Vikings were to restructure Joseph’s contract, it would free up roughly $6 million. That wiggle room could be huge going into the second wave of free agency. Now, the reason I don’t see this happening is that Linval Joseph has been one of the best pieces on their defense. The Vikings could restructure his contract so that he gets less money in 2019 and more guaranteed money down the road, but only time will tell if that will happen. Vikings fans probably don’t want to lose any of these players, and they might not have to. That being said, if the Vikings want to make any “big” moves in free agency before the draft, they will have to make some changes along to roster to free up some salary cap space. It will be interesting to see what Rick Spielman does before the draft. 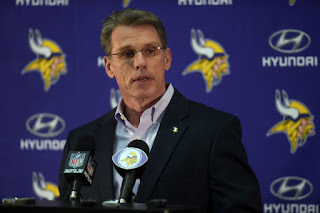 The Vikings obviously have holes along the offensive line and other parts of their roster, but given the Vikings’ cap space situation, Spielman might have to wait until the draft to address those issues.